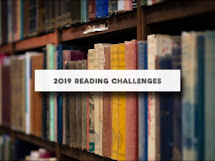 What perfect timing that this week's theme starts with L. I just finished reading Julie Lessman's A Hope Undaunted,(review) book one in the Winds of Change series that continues the story of the O'Connor siblings from The Daughters of Boston Series. 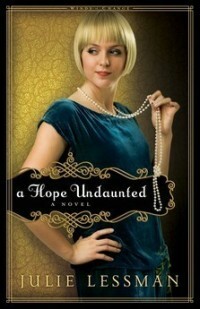 I joined in on the A Hope Undaunted blog tour not realizing the book was a continuation of another series. I enjoyed the story and the characters so much, wanting to find out more about them, so was happy to discover I could. Julie Lessman's story of the O'Connors is a passionate one, but from a christian perspective so heated romance and passion without the R rated stuff. Her characters are very real and life isn't simple or always easy and wrapped up in a neat little package. Lessman does an excellent job of portraying a faith filled family without getting overly preachy. Faith is a part of their lives and blends in with the story. The Daughters of Boston series is a historical romance set in the early 1900's and starts with Faith's story in A Passion Most Pure, then Charity in A Passion Redeemed, and little sister Lizzie in A Passion Denied. The Winds of Change series starts with Katie in A Hope Undaunted. She is a feisty 18 year old in the 1920's who wants to be a lawyer. She has a plan for her life with a list of the perfect man and she's trying to stick to the plan even though life has thrown her a curve ball. The series will be continuing in the near future featuring her two older brothers, Sean in A Heart Revealed and Steven in A Soul Restored. If you haven't read any of her stories, I definitely recommend starting with A Passion Most Pure in order to get to know the family. I've just downloaded it to my nook and will be reading it soon. 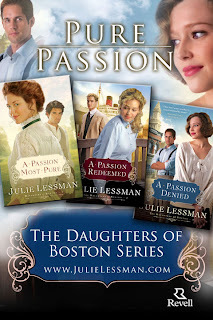 To find out more about Julie Lessman and her books, check out her story here. Having a ball, thanks so much for hosting!